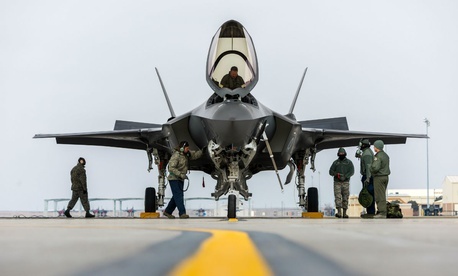 Just days into the U.S. government shutdown in 2013, several defense companies threatened to furlough thousands of their employees whose jobs were tied to federal facilities or projects that were curtailed. This year, that did not happen. Some say it’s largely because executives wanted to wait to see how Monday’s negotiations on Capitol Hill played out, perhaps giving a better indication of how long the shutdown would last. That’s something that didn’t happen in 2013 when firms threatened furloughs, which didn’t largely materialize because the Pentagon recalled many civilian workers a few days into the 16-day shutdown. “It gets worse over time,” said Frank Kendall, who was defense undersecretary for acquisition, technology, and logistics during the Obama administration. He spoke at the Center for Strategic and International Studies on Monday, just hours before lawmakers reached a deal to keep the government open until Feb 8. During a shutdown, government employees who support combat operations — military and civilian alike — keep working even though their paychecks stop coming until the government reopens. But the impact on companies varies. Some contracted employees who are supervised by government officials cannot report to work — say, when their government facility is closed. That leaves defense companies with a decision: Pay the affected employees for not working, or furlough them. Kendall said they often pay employees for a few days at the beginning of a shutdown. Shutdown can also have a “major impact” at manufacturing facilities. Some items that are finished — say, an F-35 Joint Strike Fighter or Abrams tank — get parked outside the factory until government inspectors come back to work. But the lack of inspectors — generally dubbed not “excepted” personnel — can cause hiccups for stuff still on the production line. That usually affects blue-collar workers on the assembly line and the company itself. Timing is everything during a shutdown. Immediately, the impact might be minimal, but “pretty quickly you get into trouble that’s much more significant,” Kendall said. So how did Monday’s shutdown affect the largest defense firms? Boeing, General Dynamics, Northrop Grumman, and L3 Technologies declined to comment. But all of the firms’ CEOs will report 2017 fourth-quarter earnings in the coming two weeks, so expect to hear some shutdown talk on conference calls with Wall Street analysts. But the firm said it had contingency plans to minimize the impact. BAE Systems said it anticipated a “minimal” impact on its employees. Three days into the 2013 shutdown, United Technologies, then owner of helicopter maker Sikorsky, said it would furlough up to 5,000 employees. Four days in, Lockheed Martin said it would furlough 3,000 employees who worked at government facilities that were closed down. Five days in, most government civilian workers were recalled to their jobs, leading companies to keep their workers on the job or reduce furlough estimates.